Candidate - someone who is baptized in another faith tradition who now seeks to join the Catholic Church. Catechumen - someone who is not baptized. Catholic who has been baptized but never received the sacrament of Confirmation. The RCIA participant explores and learns about what it means to be Catholic. This includes more than obtaining knowledge about the Catholic Church. The participant will learn how a Catholic prays by taking part in Catholic liturgy, how a Catholic loves their neighbor by taking part in acts of charity, how a Catholic lives within a community by taking part in the community's activities and how a Catholic thinks and believes by learning Catholic teaching. As long as is needed, anywhere from a couple months to a couple years. Each person and their faith journey and past history is unique and therefore the amount of time they need to be in formation varies. The process is tailored to each person and moves at the pace that each individual needs. This respects how God has been working and known within the individual's life long before they join the RCIA. Our program is a year-round program so an interested person is able to explore or join whenever they feel they are ready. 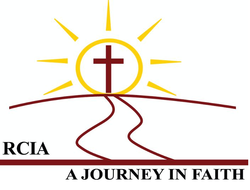 What Do I Do if I'm Interested in Joining the RCIA or just Learning More About the Catholic Faith? Contact Fr. Aaron Junge for more information.